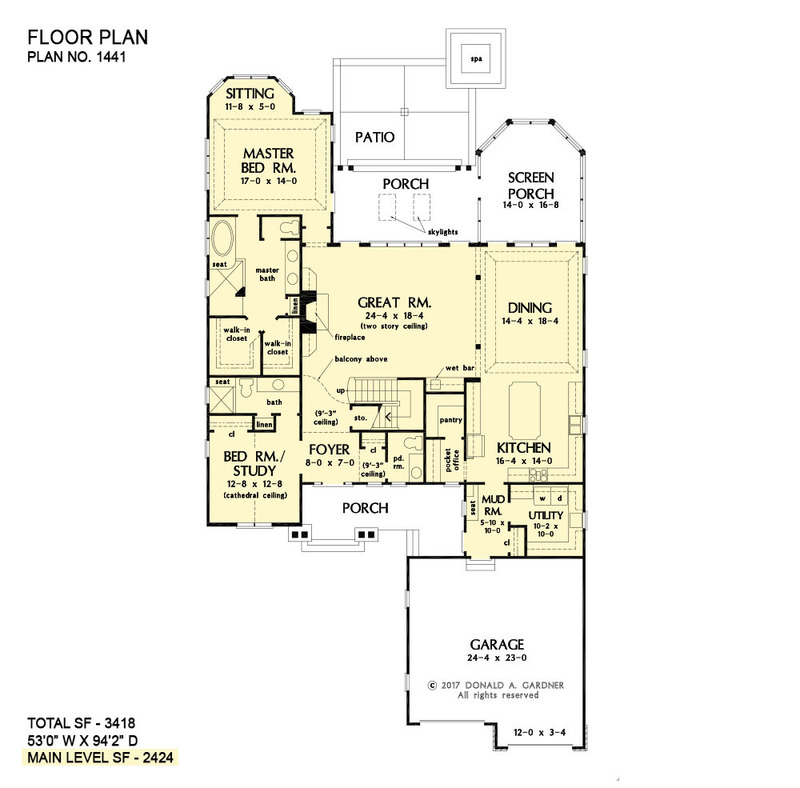 The Stella home plan doesn't sacrifice square footage or comfort to achieve a narrow footprint. This stylish exterior features sloping roof lines, arched windows, stone accents, and a front porch framed in columns. Interior columns divide the open great room and dining room and the island kitchen leads the way to a pocket office, pantry, mud room, and spacious utility room. The master suite expands to the rear of the home with an intricate tray ceiling and bayed sitting room. Take living outdoors with rear porches and a patio. Upstairs, two bedrooms are separated for privacy, each with a full bathroom and walk-in closet. A library with built-in shelves welcomes an extensive book collection. 1st Floor: 2424 Sq. 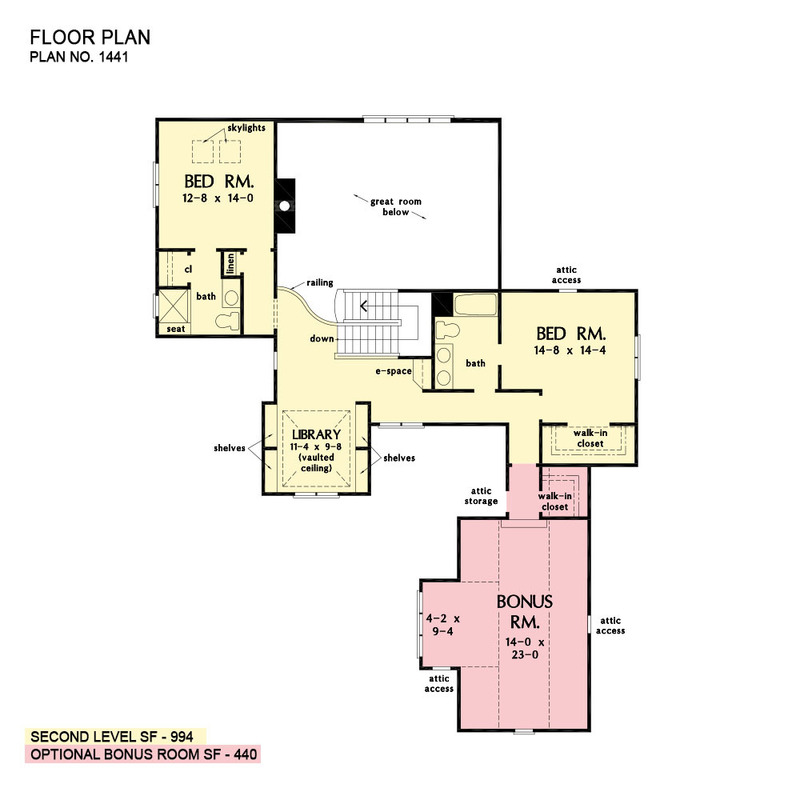 Ft.
2nd Floor: 994 Sq. Ft.
Porch - Front: 184 Sq. Ft.
Porch - Rear: 220 Sq. Ft.
Porch - Screened: 242 Sq. Ft.
House Dimensions: 53' 0" x 94' 2"
Great Room: 24' 4" x 18' 4"
Master Bedroom: 17' 0" x 14' 0"
E-Space (Flat): 3' 8" x 3' 4" x 9' 0"
Library (Vaulted): 11' 4" x 9' 8" x 11' 6"
Mud Room (Flat): 5' 10" x 10' 0" x 10' 0"
Pocket Office (Flat): 5' 4" x 6' 0" x 10' 0"
Wet Bar (Flat): 5' 4" x 2' 0" x 10' 0"
Storage (1st Fl.) (Sloped): 3' 8" x 3' 4" x 0' 0"
Foyer (Flat): 8' 0" x 7' 0" x 10' 0"
Dining Room (Tray): 14' 4" x 18' 4" x 10' 6"
Great Room (Flat): 24' 4" x 18' 4" x 20' 1"
Kitchen (Flat): 16' 4" x 14' 0" x 10' 0"
Utility Room (Flat): 10' 2" x 10' 0" x 10' 0"
Bonus Room (Clipped): 14' 0" x 23' 0" x 10' 0"
Garage (Flat): 24' 4" x 23' 0" x 0' 0"
Master Bedroom (Tray): 17' 0" x 14' 0" x 10' 6"
Bedroom / Study (Cathedral): 12' 8" x 12' 8" x 14' 4"
Bedroom #3 (Flat): 12' 8" x 14' 0" x 9' 0"
Bedroom #4 (Flat): 14' 8" x 14' 4" x 9' 0"
Porch - Front (Flat): 12' 0" x 7' 8" x 10' 0"
Porch - Rear (Flat): 20' 4" x 10' 10" x 10' 0"
Deck / Patio (None): 20' 0" x 15' 0" x 0' 0"
Porch - Screen (Flat): 14' 0" x 16' 8" x 10' 0"